The infamous prison island of Alcatraz is now a standalone Blackout location! Available for all players on PS4, Alcatraz is completely separate from the main Blackout map, allowing for two distinct game experiences. Focused more on close-combat battles, the Alcatraz action takes place throughout the overcast island shrouded in a fog-filled gloom, creating a dramatic and intense atmosphere, where you’re dropped in from skybound portals with only limited time to gear up and start taking down enemies. 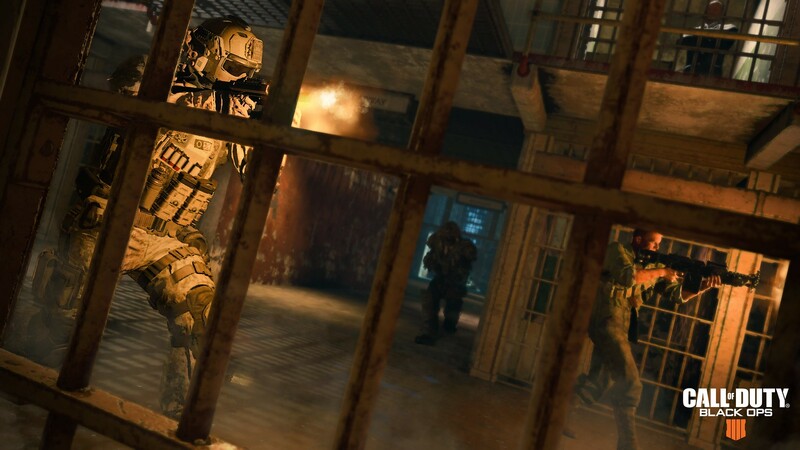 Size-wise, the prison is far more compact compared to the main Blackout map, leading to more focused and immediate combat as dozens of competitors fight for control. 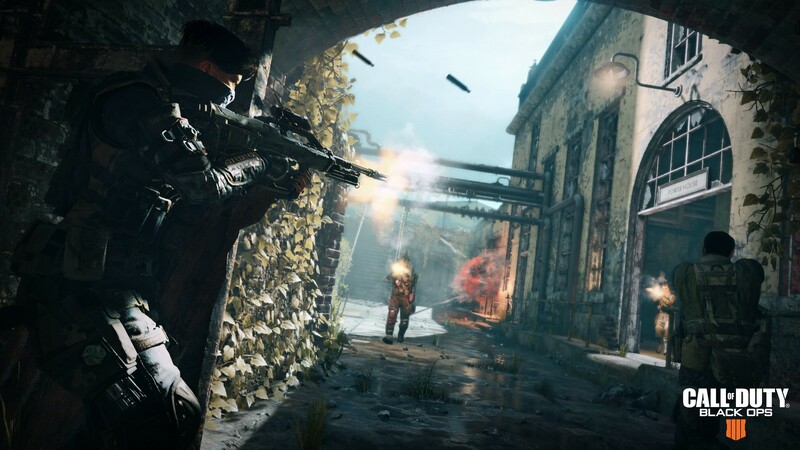 Expect thrilling and chaotic firefights almost immediately, with you and your teammates vying for items and strategically-advantageous positions both in and around the many structures dotted throughout this prison island. It’s time to change up your tactics compared to the main Blackout map. In Alcatraz, a greater reliance on twitch skills and close-quarters combat leads to shorter, more frenetic battles where you’ll spend far less time to concoct a long-term plan, and more time scrambling for items and cover! Stalk your enemies across the claustrophobic prison yards, warehouses, jail cells, and dockside structures… many of which will feel right at home for Zombies fans. With the intensity dialed up to 11, expect matches to last around ten minutes, quicker than the 25-minute games in the main Blackout map. Shorter matches, tighter areas, and condensed player counts mean higher chances for more nail-biting victories! The divergent environments across Alcatraz range from rocky shorelines and caves, rusting Navy vessel wreckage, abandoned field hospitals and tents, a temporary helipad, industrial warehouses, apartment blocks, a variety of overgrown foliage, a powerhouse with a cooling tower, and dominating the “top of the Rock” is the derelict prison itself, where you can expect the firefights to be the most intense. As well as looking out for foes, you’ll need to look up too. Traversing the nine named destinations across Alcatraz is totally different compared to the original Blackout map. Alcatraz has a ridge-like topography, with a much higher building density, more tight corners to ambush and attack from, and a real sense of verticality as you ascend to the main prison on the highest ground. With such a change from the original Blackout map, it’s worth reassessing your item choices as you prepare for combat. As the circle closes in on you, it could be worth stuffing your backpack with equipment you normally might not think about employing: While close-combat weapons are obvious choices, the Grapple Gun is a great asset when maneuvering through the tight prison hallways, shadow-filled staircases, or treacherous balconies littered with barriers. Why go through them when you can grapple over them? Also, take some time to drop Razor Wire or Barricades to provide chokepoints in any narrow space, be it a corner, doorway, or stairwell, and stop potential flankers while you finish your adversaries off. Oh, and do keep an eye out for flesh-eating zombies. 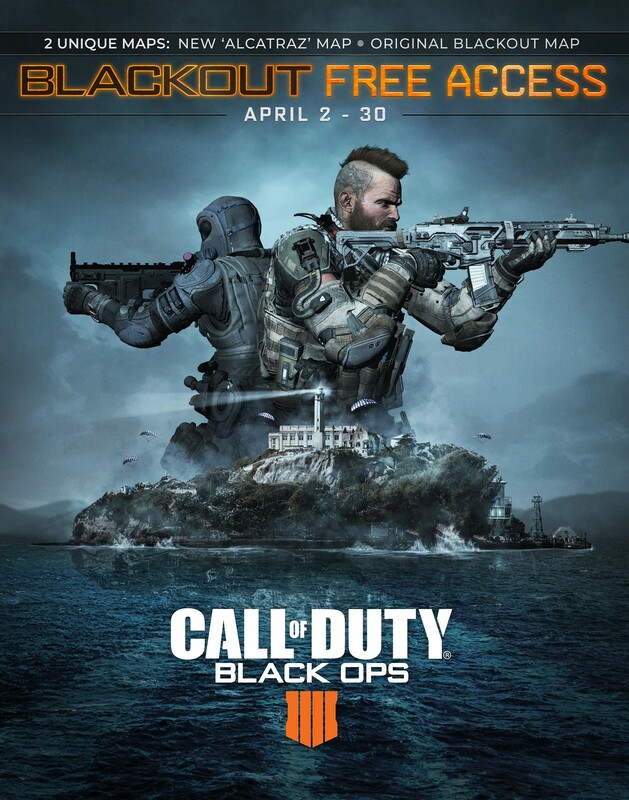 Blackout: Alcatraz is available on PlayStation 4 starting April 2 for Call of Duty: Black Ops 4. All PlayStation Plus members can take part in Blackout Free Access on both Alcatraz and the original Blackout map, including all the latest spring color and weapon updates. You’re able to matchmake with all Blackout players, including Solos, Duos, and Quads, and any progression you make can be saved and transferred if you upgrade to a paid version of Call of Duty: Black Ops 4. There’s never been a better time to play Blackout. Leave none standing to win! 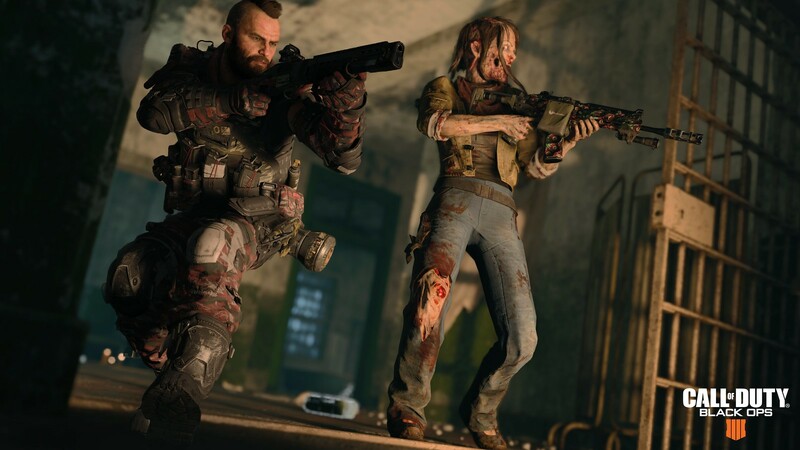 The limited-time Blackout Free Access period begins April 2, 2019 and ends on April 30, 2019.